Calais Basket Cheminots JMC (NM2) landed 25-year old Mali international forward Ibrahim Djambo (208-98kg-92, college: Hofstra). He has a double citizenship as he also holds American passport. Djambo played most recently at Stade Nabeulien in Tunisian Division I. The previous (16-17) season he played at Seguros Soliss Alcazar Basket in Spanish LEB Silver where in 16 games he averaged 5.0ppg and 2.9rpg. Among other achievements Djambo received Afrobasket.com All-Afrobasket Championships Honorable Mention award in 2017. He also represented Mali at the Afrobasket Championships 21 years ago. His stats at that event were 3 games: Score-3 (17.0ppg), 6.0rpg, 1.3spg, FGP: 40.0%, 3PT: 22.7%, FT-3 (88.9%). Djambo graduated from Hofstra University in 2016 and it is his third season in pro basketball. #1. This week's number one is former U16 international power forward Cheick Diallo (206-96, college: Kansas, currently plays in NBA). 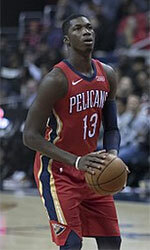 Diallo contributed to a 3-point New Orleans Pelicans' victory against the Sacramento Kings (37-38) 121-118 in the NBA last Thursday. He scored 7 points and grabbed 4 rebounds. The New Orleans Pelicans have 32-45 record this season. It was his team's first victory after three consecutive loses. This season Diallo averages: 5.8ppg, 4.9rpg, 2FGP: 61.5%(147-239) and FT: 73.8%. He played for the Mali U16 national team eight years ago. #2. Second place goes to an international power forward Nianta Diarra (203-93, currently plays in France). Diarra contributed to a 2-point Boulazac Basket's victory against the 15th-ranked Le Portel (8-15) 72-70 in the French Jeep ELITE ProA on Friday night. He scored 7 points in only 14 minutes. Boulazac Basket Dordogne (13-10) is placed eighth in the Jeep ELITE ProA. It was his team's third consecutive victory in a row. This year Diarra's overall stats are: 3.8ppg, 3.3rpg, 2FGP: 58.3%(28-48), 3FGP: 28.6% and FT: 52.0% in 23 games he played so far. He has a dual citizenship: Mali and French. Diarra is in the roster of the Mali senior national team. #3. The Mali player who performed third best last week abroad was an experienced former international guard Ludovic Chelle (188-83, currently plays in France). He led Saint Vallier to a victory over the seventh-ranked Rueil (4-6) 78-60 in the French NM1 (third division) in Tuesday night's game. Chelle was MVP of the game. He scored 15 points. Saint Vallier Basket Drome (4-6) is placed sixth in Places 1-10 group. It was his team's third consecutive victory in a row. It's Chelle's first season with the team. Chelle's total stats this year are: 9.2ppg, 2.1rpg, 1.4apg, 1.1spg, 2FGP: 44.1% and FT: 68.4%. He is another player who holds two passports: Mali and French. Despite Chelle played previously for the French U20 national team, he played also for the Mali national team in 2011. #4. Forward Cheick Soumaoro (204-90, currently plays in France) contributed to an easy victory against the tenth-ranked La Charite (2-8) 88-71 in the French NM1 (third division) last Tuesday. Soumaoro scored 6 points in 16 minutes. Saint-Quentin Basket-Ball (8-2) is placed second in Places 1-10 group. They ended the series of three consecutive loses. This year Soumaoro's total stats are: 6.8ppg and 4.0rpg in 28 games. He is also Mali national team player. #5. International point guard Ibrahima Sidibe (180-95, currently plays in France) was the main contributor in a GET Vosges' victory against the eighth-ranked CFBB (0-5) crushing them 90-59 in the French NM1 (third division) on Friday night. Sidibe was the best player in that game. He recorded 26 points (!!! ), 4 rebounds, 5 assists and 5 steals. Golbey Epinal Thaon Vosges (5-2) is placed first in Places 21-28 group. There are only three games left until the end of the Second Stage. So now every game will be critical. Sidibe has individually a very good season with high stats. He averages: 17.6ppg, 3.7rpg, 3.4apg and 1.6spg. Sidibe has both Mali and French nationalities. Despite he played previously for the French U20 national team, Sidibe is currently in the Mali national team roster. #6. Center Boubacar Sidibe (205-94, currently plays in Spain) contributed to an easy victory against the leader Navarra (18-9) 80-62 in the Spanish LEB Silver (third division) last Friday. He scored 6 points. It was the game of the round between two top 3 ranked teams in group East. HLA Alicante (23-4) is placed first. It was his team's 13th consecutive victory in a row. Sidibe has averaged so far 2.7ppg and 2.4rpg. He is an international player who is currently on the senior Mali National Team roster. #7. International point guard Ibrahim Saounera (179-87, currently plays in France) was the major contributor in Lorient's victory against the sixth-ranked Aubenas (1-6) 86-70 in the French NM1 (third division) in Saturday night's game. He recorded 15 points and added 4 assists. CEP Lorient (4-1) is placed second in Places 21-28 group. It was his team's first victory after four consecutive loses. There are only three games left until the end of the Second Stage. So now every game is very crucial. Saounera has relatively good stats this season: 12.7ppg, 2.7rpg and 4.0apg. He is also Mali national team player. #8. Shooting guard Mahamadou Drame (188-86, currently plays in France) could not help Feurs EF (4-6) in their last game. Despite Drame's good performance the seventh-placed Feurs EF (4-6) lost 75-86 on the road to the higher-ranked (#6) Toulouse in the Places 11-20 group. He was the second best scorer with 13 points. Drame also added 6 assists in 26 minutes. It was Feurs EF's third consecutive loss in a row. Drame has averaged so far 9.2ppg, 3.1rpg, 2.1apg and 1.1spg in 14 games. He plays currently for the Mali national team. #9. Former international forward Namory Boundy (202-89, currently plays in France) is a teammate of previously mentioned Ibrahima Sidibe and both played together in the last French NM1 game. Boundy contributed to an easy victory against the eighth-ranked CFBB (0-5) crushing them 90-59. He recorded 11 points. Boundy has averaged so far 8.7ppg, 2.9rpg, 1.4apg and 1.2spg. He used to play for the Mali national team four years ago. #10. Swingman Samba Balayera (195-96, currently plays in France) is a teammate of previously mentioned Ibrahima Sidibe. He played also in the last French NM1 game facing Namory Boundy (above) in the other team. Balayera contributed to an easy victory against the eighth-ranked CFBB (0-5) crushing them 90-59. He recorded 12 points in 26 minutes. This year Balayera averages only 7.8ppg in 17 games. He is an international player who is currently on the senior Mali National Team roster. #11. Former international power forward Baba Samake (200-94, currently plays in France) is a teammate of previously mentioned Ibrahim Saounera and both played together in the last French NM1 game. 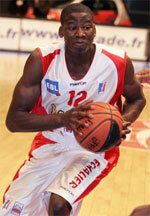 Samake contributed to an easy victory against the sixth-ranked Aubenas 86-70. He recorded 7 points and grabbed 7 rebounds. Samake has averaged so far 4.4ppg and 4.9rpg. He used to play for the Mali national team two years ago. #1. Bandja Sy (204-F-90, agency: BeoBasket, college: N.Mexico St., currently plays in ABA League). He could not help Partizan (14-8) to beat Crvena Zvezda (21-1). Sy recorded 9 points and grabbed 6 rebounds in 26 minutes. But Partizan lost 101-106 in a derby game to the leading Crvena Zvezda. This year Sy averages: 6.8ppg, 3.6rpg and 1.3apg in 22 games he played so far. He has a dual citizenship: Mali and French. #2. Nouhoum Bocoum (207-F/C-92, college: Arkansas St., currently plays in Spain) was not able to help Aridane (8-17) in their last game. Despite his very good performance the 13th-placed Aridane (8-17) was crushed 100-79 on the road by the much higher-ranked (#3) Nautico Tenerife in the Group B. Bocoum was the top scorer with 21 points. He also added 5 rebounds (was perfect 5-for-5 from the free throw line) in 34 minutes; quite an impressive performance considering it's only Bocoum's third season in pro basketball. It was Aridane's third consecutive loss in a row. Bocoum has individually a very good year with high stats. He averages: 18.4ppg, 9.7rpg and 1.4apg in 25 games. Bocoum is another player who holds two passports: Mali and American. #3. Souleymane Diakite (206-F-99, currently plays college basketball in the States) was not able to secure a victory for the NJIT (8-8) in their game against the Hampton University (12-6) in the NCAA 1/8 Finals. Diakite scored only 4 points, grabbed 5 rebounds and made 2 blocks in 19 minutes. The NJIT lost 70-82 in Hampton to the University. Diakite has averaged so far 1.8ppg and 2.9rpg in 16 games.